Outline: Introduction is on local fears. Questions directed to listener. Explains freedom from fear through Jesus. Mentions His miracles, power, willingness to help and save, deliver and protect. His power is greater than demons, witchdoctors, curses. Jesus overcame Satan and death. When He arose from the dead He received from God all power. Therefore He will give eternal life to all who believe in Him and they will be free. Are you afraid? Are you afraid of the darkness? Are you afraid to die? Do you fear evil spirits? Satan? The owl? Do you want fear to leave you forever? Then listen. I have wonderful news for you. They are wailing because of death. Here is the good news that I have for you. Jesus died for you. Then He came back from the place of death and is now alive. And if you leave your sin and trust Him, someday He will take you to heaven, where He is now. 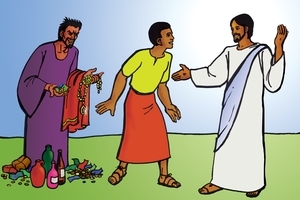 If you follow Jesus, He will take from you the fear of evil spirits. But you must leave your sin. You must refuse evil dances, drinking, sorcery, witchcraft, adultery, and all other evil things. Then if you follow Jesus with all your heart, He will guard you from these evil spirits. When you hear the owl (Pause 3 sec. for owl) you do not need to fear, for Jesus is with you to protect you. *Do you still offer food to Satan, or build him a house, or keep sticks in the ground for him? It is impossible to serve Satan and God. If you truly believe in Jesus, you do not need to fear Satan. When Jesus died and rose again, He broke the power of Satan. When we follow Jesus, we follow One Who has all power - power over death, over darkness, evil spirits, and Satan. Now, my friend, receive Jesus and you will go to that wonderful place, heaven, to live forever and ever after you die. There is nothing bad up there, and nothing to fear. There is only joy forever and ever. Would you not like to receive Jesus and go to that place of joy? You may talk to Him now. He will hear you. *Note: Refer only to local practices. GRN has recorded a version of this script in 317 languages and dialects. See full list.